With the Interim Budget 2019-20 on the anvil, real estate stakeholders have prepared their wish list already. From subsuming stamp duty under the Goods and Services Tax (GST) to the extension of 80IBA provisions for housing projects up to 200 sq m carpet area, industry stalwarts have big hopes pinned to the upcoming Interim Budget 2019-20. The multiple reformatory moves announced by the government in the past two years not only dwindled the realty sales but also affected the functionality of property merchants. From shelving their new project announcements and focusing on Real Estate (Regulation and Development) Act, 2016 (RERA) compliances to realigning their businesses as per the new tax norms, developer fraternity across the country, sincerely adhered to the enforced laws. However, there is still scope for reforms, which the industry stalwarts think have the potential to lead the sector towards revival and are waiting for the announcement of those in the upcoming Budget 2019. Given the current economic situation, rationalisation of taxes seems to be the critical expectation from the interim budget across the country. Also, bringing stamp duty within the purview of GST; input credit of construction against the output of renting; incentivising rental housing to meet the ambitious project ‘Housing for All’ by 2022 and increasing the limit of interest deduction paid on home loan from two lakh to three lakh are other important agendas on the list. The scope of Section 80IBA of IT Act 1981, which allows a deduction equal to 100 percent of gains derived from the affordable housing project, should be widened by bringing all categories of affordable housing meant for EWS, LIG, MIG-I and MIG-II under its purview. Also, 80IBA should include projects approved on or after June 1, 2015, when Pradhan Mantri Awas Yojana (PMAY) was launched, instead of June 1, 2016, as prescribed. Besides, its applicability should be extended to projects up to 200 sq m carpet area, instead of the current limit of 30 sq m for four metros and 60 sq m for other cities, to cover all segments of homebuyers. This is imperative to achieve the Government target of ‘Housing for All’ by 2022. The issue of stressed assets in the form of land parcels and delayed projects, which have troubled the sector and homebuyers for long, should be addressed in the Interim Budget 2019-20. The stressed assets have been a cause of concern for developers as well as homebuyers, who are struggling to get the possession of their booked properties. Stressed assets can become an opportunity if the government and lending institutions come forward and arrange the required funds to complete the stalled projects. In the upcoming budget, we hope the government takes more developer and investor-friendly initiatives for the betterment of the real estate market. Providing interest rate subventions and increasing the cap on home loans eligible for subsidies are expected from the budget to ease the financial burden on the homebuyers. Moreover, separate provisions for income tax exemption limit for EMIs on housing loan are expected to make homes affordable for the mid-income groups. Additionally, a seamless approval process is essential as it could help in faster execution of infrastructure and real estate projects. Overall, we hope the government takes measures which strengthen the real estate sector and affirms robust infrastructure growth. The government’s move to subsume multiple taxes under one, i.e. GST, was one of the most rational initiatives. However, the concern pertinent to ‘Stamp Duty’ remains intact. Besides, industry status for the real estate sector is another request that has gone unnoticed by the government for long. Since the industry was the worst hit after demonetisation and has only recently started to show signs of recovery, a change in the status would make it easier for developers to raise funds at lower rates. We also hope that the government reduces the GST rate applicable to the housing segment, as it would be an ideal boost for the sector. Abatement for land should be increased to 50 percent. The single-tax regime in India ushered in additional cost pressure on real estate. Presently real estate falls under the 18 percent tax bracket of the Goods and Services Tax (GST) with 1/3rd abatement for land taking the effective tax rate to 12 percent. However, in major metros, the share of land is more than 50 percent of the project cost. We, therefore, recommend that the government aligns this with market realities and accordingly increase the abatement for land to 50 percent, thereby bringing down the effective tax rate to nine percent. The government should curb or altogether eliminate angel tax in the upcoming Interim Budget 2019-20 as it would enable the co-working firms to lease more spaces for start-ups, enterprises, MSMEs and entrepreneurs. Angel tax, as many believe, would destroy the start-up edifice, and indirectly co-working firms would desist from leasing co-work spaces. Angel funding is considered as income and is taxed at a full income tax rate of 30 percent. This will detract higher investment in co-working spaces. Besides, co-work firms are also hoping that bank funding for start-ups should be enhanced from Rs 25 lakh to Rs one crore to ensure increased access to financial resources for start-ups in the country. The provision of REITs this year is likely to improve the quality of assets offered, leading to positive investor and consumer sentiment in the sector. Moreover, the clarity on the GST on under-construction houses will further provide an impetus to the realty sector. In this year’s interim budget, the sector has pinned hopes for clarity on SEZ taxation, subsuming of stamp duty under GST, promotional of rental housing and integrated townships, and incentivisation of affordable housing. All these measures will help in streamlining the industry in the long-run. We are hoping that the Finance Minister grants infrastructure status to the housing sector, which will be encouraging for developers. Infrastructure status will ensure easier access to institutional credit and help in reducing developers’ cost of borrowing for affordable projects. It will further reduce the approval processes and increase transparency in the sector. Furthermore, it will be an ideal situation if the GST is revised for real estate to make it more attractive and affordable. A single window clearance mechanism for project approvals will be beneficial for both the developers and the consumers. Additionally, the interest paid on loans taken for purchasing a residential property capped at Rs 2 lakh under Section 24(b) should be increased for self-occupied properties which will lead to increased interest in home buying. Various policy reforms and initiatives rolled out by the government had finely regulated the real estate sector but still there is a thin line between success and failure of the target ‘Housing for all’. Not many initiatives have been announced for the execution of Smart City developments or budgeted housing, which is the need of the time. The time required for development to be executed above the ground is short and many private developers are already under deep stress. Therefore, the government should focus on building policies driven by PPP model and Co-development to achieve Housing for all by 2022. Also, the effect of fiscal failure of various financial institutions and banks should be carefully addressed. Disciplinary ways for infusion of capital in the sector should be ensured since the monetary deficit since the last two quarters is adversely affecting the already struggling real estate sector. It is indeed interesting to see how the government will aim at achieving the balance between the buyers and the developers. It is indispensable to give buyers the right kind of incentives to get the buying sentiments in shape; however, it is also equally imperative to lower the overall construction costs for the developers. The government must aim at bringing stamp duty within the purview of GST to reduce the tax burden on the buyers. They must also focus on ensuring that the benefit of Input Tax Credit is passed on to the buyer as well. Moreover, to initiate quicker zoning approvals and environmental clearances, much emphasis should be paid to single window clearance system. The industry is hoping that its concerns relating to rationalisation of taxes and infusion of liquidity in the markets shall be duly addressed by the government in the upcoming Budget 2019. The reduction in tax rate would help millions of homebuyers and the real estate industry. It will also benefit the entire value chain dependent on construction sector, which is a major contributor to India’s infrastructural growth and the second largest contributor to country’s GDP. Therefore, real estate sector entails stable and forward looking policies and interventions that will help the real estate and the economy to move forward. Developers are hoping real estate sector to get an industry status in the upcoming Budget 2018-20. The development would not only boost real estate momentum but would also catalyse institutional funding. Single window clearance also needs to be taken into consideration for faster implementation and execution of projects. Moreover, in a bid to aid developer fraternity, the government should focus on raising the NBFC financing limit as it will be make fund procurement process easier for developers. While there are numerous expectations from the upcoming interim Budget 2019, there a few which the industry stakeholders hope witnesses the light of the day. Firstly, rationalisation of GST in real estate is imperative to create conducive business environment. Secondly, granting infrastructure status to the entire sector along the lines of affordable housing is another step that should be taken. Last but not the least, an effective and structured implementation of single window clearance is essential to streamline the project approval process and boost the real estate sector. Currently, the real estate sector is saddled by three compelling issues - high inventory, low liquidity and high input costs. I hope the upcoming Budget addresses these issues by introducing financial reengineering concepts to overcome the NBFC crisis, offering favourable tax structure, revising the GST policy and applicable percentages, reducing the home loan rates, and focussing on the infrastructure development and growth. Overall, the Budget, through its policies, should aim at creating a positive environment in the real estate sector for both the homebuyers and the developers. 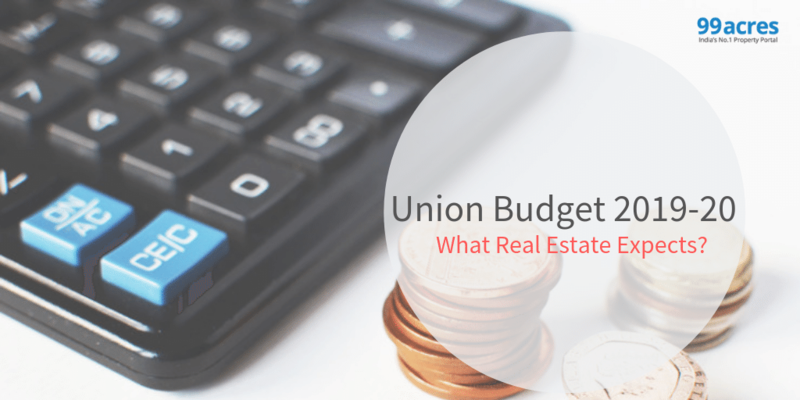 Abhishek Bhardwaj, CMO, Shristi Infrastructure Development Corporation Ltd.
Our expectation from this year’s Union Budget is a reduction in house loan rates for home buyers with more tax benefits. A GST rate revision (for home buyers) is expected to boost the realty sector, especially the affordable housing segment. In addition, an effective and structured implementation of single window clearance is required to streamline the project approval process and boost the real estate sector.